On a rare warm day in January, I had the pleasure to photograph Amelia + Carson at Homestead Manor in Thompsons Station, Tennessee. The bridal suite is where I took the bridal portraits of Amelia. MHD Beauty was on hand to do hair and makeup as I shot her in the Olia Zavozina mermaid lace dress. A new baker, Just Call Me Sugar, created a beautiful naked cake for the occasion. Ashley at Forget Me Not florist made a stunning bouquet. After the bridal portraits, Amelia changed into a beautiful lacy two-piece A-line gown with gorgeous flair. We walked around the Homestead Manor for the bride and groom shots as the sun began to set. Carson looked dapper in his tuxedo and was a perfect compliment of masculine to Amelia’s feminine. I love their story. 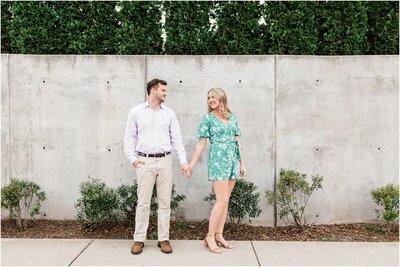 They met in college but didn’t really get to know each other until they were at a wedding together. Their first date couldn’t have been more Nashville perfect, lunch at the Pharmacy in East Nashville then to a Titans game. They are too cute!